Then it gets the fully qualified path for its own file to open it afterwards (GetModuleFileName() + CreateFile()). If that fails the Dropper again exits without doing anything malicious. Now the Dropper sets a file pointer to the beginning of the file to be dropped (SetFilePointer()) and copies it into a buffer by using ReadFile() function. Thereafter it builds the string "C:\Documents and Settings\<Username>\Local Settings\Temp\conhost.dll" with the before retrieved temporary path. Then it checks if there is already the file "conhost.dll" in the temporary folder (probably to check for an older version of the malware) and renames it if it exists to "conhost.dll.tmp". There follows the decryption of the file in the buffer (file to be dropped) and finally the file is written to disk in the temporary folder as "conhost.dll". At last the file (.dll) is loaded by forming the string "rundll32.exe C:\Documents and Settings\<Username>\Local Settings\Temp\conhost.dll,Start" and using CreatProcess() function to start rundll32.exe program. Finally "conhost.dll" gets deleted from temporary folder to cover the tracks. Now let's take a look into the 3rd Dropper. At first it also decrypts some function names, library names and other strings for subsequent use. Then it again dynamically resolves the API adresses of various functions (LoadLibrary() + GetProcAddress()). There follows the same anti (AV) emulation technique (two MMX instructions) as it was used in the initial Dropper and the Downloader. The same strings are encrpted and added to the Registry Key "HKEY_CURRENT_USER\SOFTWARE\Microsoft\Windows\CurrentVersion\Explorer" but with other 6 random hex values as encryption Key. As we already saw in the initial Dropper, the 3rd Dropper also searches for the file "els.dll" in system directory to get its file time and uses system time if it fails. 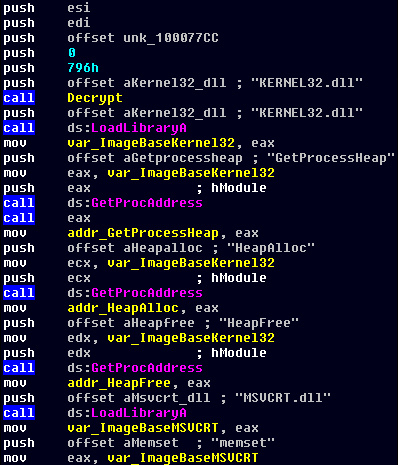 And as we saw in the 2nd Dropper (conhost.dll), the 3rd Dropper also uses the same technique to load the file to be dropped (final Payload) into a buffer for decryption by using GetModuleFileName(), CreateFile(), SetFilePointer() and ReadFile() functions. Then it looks if there is already a netui.dll in system folder (C:\Windows\System32) and creates the final Payload by writing the bytes from the buffer into the netui.dll file, if this is not the case. Thereafter it sets the file's time to one of the two retrieved before. 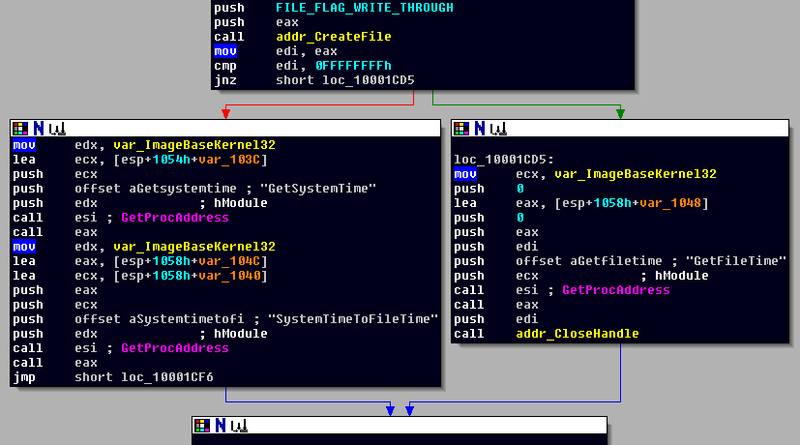 I think the malware author chosed the name "netui.dll", because in Windows XP system directory there exist the files "netui0.dll", "netui1.dll", "netui2.dll", so it doesn't look suspicious. Now if the installation and setup of the file in the system directory (C:\Windows\System32) failed, the malware tries to accomplish the same procedures as above in the local application data folder (SHGetFolderPath() -> C:\Documents and Settings\<Username>\Local Settings\Application Data). That's all of the 3rd Dropper's functionality. In this second Part we analyzed the downloaded file which turned out to be just another Dropper. This file drops yet another Dropper, which in turn drops the final Payload. So let's move to the most interesting part, the final Payload. IP Location: Panama Panama Panama Cyber Cast International S.a.